This installation is part of the Revealing Histories project celebrating 900 years since the founding of the town of Kidwelly, Carmarthenshire. 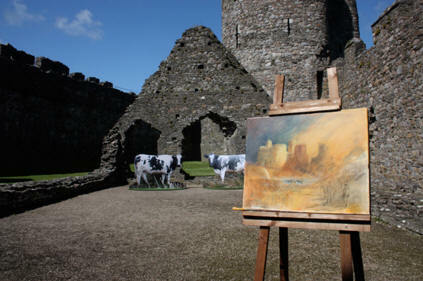 It pays homage to the English landscape painter J M W Turner who visited Kidwelly during one of his tours of South Wales when he painted a view of the castle in 1832. His depictions of famous ruins, such as Tintern Abbey and Harlech Castle have become part of our landscape vocabulary and have changed forever the way we see them.